Hello sweet Soul Sistars... I was born a SCORPIO with my moon in AQUARIUS into a family of girls (two sisters and a mom who enjoyed being a woman) We had a mom who always ironed our ruffly dresses. We looked pretty most of the time! I loved growing up with SISTERS! Then along came our baby brother and boy, did we have fun mothering him (lucky guy!). We had such fun exploring the world together. We would talk, talk, talk about what we thought made it work. Yes, we were all explorers of "what makes this world tick?" Each of us was trying to discover the secrets of life in her own way. Watching my mother in the garden when she planted flowers and trimmed the irises was such a comfort to me as I was growing up. As my mother cut the long fronds of the Irises I gathered them into a large green pile. Then I would get a big needle and some tough string (which she had around the house because she and her mother, our grandmother, were seamstresses) and I would string the Iris fronds together to make wonderful HULA SKIRTS for my sisters and me. We did the hula to the sun and far into the dark of night. Then, we would flop down on the lawn to see who could sight the first star in the evening sky! This was MY FAVORITE PART of the day when I just let go and let myself travel to the far places above me. I was in BLISS! The stars in the sky came out one by one just as the flowers did and I was comforted by the night sky. It felt to me like the arms of the Great Mother enfolding me and holding me until morning. 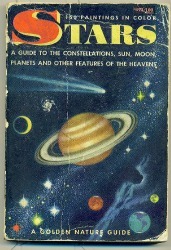 My first ever book on ASTRONOMY/ASTROLOGY was a book called STARS. I STARTED READING IT AS SOON AS I COULD READ! I still have this book as you can see. And it is WORN to a frazzle. It was a part of a Nature Guide series that my parents had in their bookshelf. Though neither of them read very much, they had a few good books and this was the ONE for ME! I read it cover to cover about a hundred times. I was fascinated by the images of the planets, the way the stars formed pictures of people and animals that told mythological stories about curious people on marvelous quests that inhabited our night sky. The Crescent Moon especially enchanted me. It filled my heart with a great JOY each time it remerged. I couldn't get enough of the nighttime magic! I studied about time travel and what the planets were made of and did my science reports all focused on the GREAT ABOVE when I was in grade school. I started asking questions of my friends about "Who made God?" and "Where did we come from?" and "Why does the moon change?" and on and on until I realized THEY were mostly not interested like I was. So I went with my questing into High School and nearly drove my chemistry, biology and math teachers crazy! I began to study PEOPLE and my SELF, wondered why we did the things we did and why we were all so very DIFFERENT and so very much alike!!! When I was 17, I picked up a book called SUNS SIGNS by Linda Goodman (some of you will remember this book!) Within the day I had read all about myself. I went straight back to our college bookstore (yes, they had this book at our college bookstore in the 60's at Oregon State University of all things! — lucky me!). I found out about my Sun and Moon and all my planets from Linda Goodman (thank you Linda!) I evaluated everything, I learned about myself. Linda G. helped me to confirm some of the things I already suspected were true about me (like I would simplyLOVE astrology, and the GREAT MYSTERY would be with me all my life!). Since I had no one else to verify these truths about me, it was her knowledge that helped me to grow into my greater self. Simply put... I COULDN'T BELIEVE IT could be so accurate about ME - who Linda didn't even know! However, my training in Science (I was a BIOLOGY major at Oregon State University) had me convinced that 'without proper evidence' astrology couldn't be valid! I WAS HAVING A CRISIS in my CONSCIOUSNESS and I knew that by studying Astrology, I was being TAKEN INTO ANOTHER WORLD - A WORLD WITH A DIFFERENT SET OF RULES than the ones I had been taught. I was being taken into the GREAT ABOVE and I must admit: I didn't resist it too much! I never stopped studying astrology after that. Simply put, I was hooked. This was the beginning for me of a marvelous adventure into the Mysteries of Life. I began to do astrology readings for my friends to really check out my new found knowledge. I studied the subject from so many angles and wanderings in my mind. When I joined a women's circle I often shared my knowledge of where the stars were at the time of our great ceremonies and seasonal changes. I began to have a FEELING that astrology as it was currently understood, was coming from quite a MALE perspective....as was most of the world when I was growing up. Time passed, as it will, I began to desire a more FEMININE way to look at the STARS. Once again, I lay down on the lawn at night and just studied the stars, the way I imagined the first astrologers must have done it.... to receive the messages the planets and stars were giving me. This became an obsession. I was a TRUE star gazer! I discovered that the great ABOVE was VERY FEMININE INDEED. To me, it seemed like the womb of the GREAT MOTHER. I could relax now knowing that a deeper truth was emerging inside me and that this truth seemed to emanate from my heart instead of my head. I felt a COMPLETE KNOWING and a connection that became so strong that I never felt separate from the heavens after that. THE GREAT ABOVE BECAME THE GREAT BELOW...or was it the other way around?.....THE GREAT BELOW HAD BECOME THE GREAT ABOVE! The stars and cosmic realms, as I understand them, are a MIRROR for the human SOUL! My sister Sharon describes her childhood this way: "I grew up in the Pacific Northwest with 3 siblings, a lumberjack father, and a mother from New York City. I loved the green trees and grass of the forests and the beautiful colorful flowers my sophisticated mother planted around our house." These images often show up in her wok. Sharon has also been intrigued with the beauty and mystery of the archetypal images of the feminine. As a child she felt an intense connection with Virgin Mary and loved to say prayers next to statues and pictures of her in church. After graduating from Cal State Long Beach and finishing her training as an artist at Art Center College of Design in Los Angeles, Sharon worked for 10 years as a graphic designer while painting and creating serigraphs. No longer satisfied to just do beautiful images, she began to ask herself "What is my message?" -- with no immediate answer. Then in about l983 Sharon, began having a CRISIS in her consciousness also. This must be contagious among women! One afternoon as she was getting into her car (it was a little Volkswagen, blue with rust on the fenders) I tossed several of my astrology books into the back seat of her car and said "You better read these!" AND SHE DID! And then she too joined me on this journey of heart and soul FEMININE ASTROLOGY that we have been taking together ever since. Eventually, Sharon went back to school to study Jungian and Transpersonal Psychology and was a therapist for 15 years. 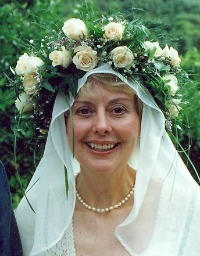 During this time she joined women's groups, some of which had the theme of the Goddess. One memorable day in 1999 she began to be flooded with images of the feminine that had an uplifting and inspiring message. Some of them came in dreams, some during meditation and some while she sat with pencil and paper. Here is a picture of Sharon the way I see her and it's by me. She is a TAURUS and this is just how she looked to me one day as I came over to her house. We were teaching an ASTROLOGY CLASS for our WOMEN'S CIRCLE and we began every class with a center altar of flowers and candles and images of stars, moons, blue sparkly scarves, whatever we could find that looked like the starry sky! Here she is preparing for one of our classes looking like a Taurus indeed!!!! For those of you who don't know how to identify a Taurus, well, they LOVE MAKING BEAUTY! Ahhhh, we owe so much to them! I titled this piece "BEAUTY COMES FROM A QUIET PLACE INSIDE A WOMAN". 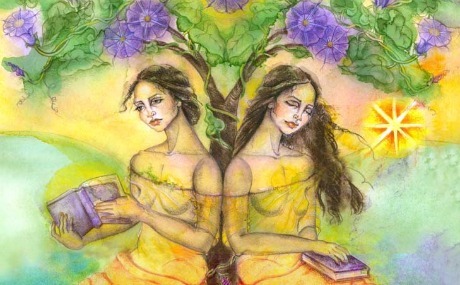 We taught many Astrology classes and began to speak to women from the place of the feminine....receptive, sharing, caring, and listening deeply to one another. We taught to those who knew nothing about astrology and those who were fairly seasoned in it. I persuaded Sharon to get back to her art. Sharon has been a great artist since she was 9 years old! I will NEVER FORGET the picture she drew of Father Bernard. Everyone was raving about it at church. I was 4 at the time and Sharon was ONLY 10 years old! It was a true likeness of him and we were all stunned at her talent! She has been drawing people ever since! While we were teaching ASTROLOGY to the GALS, I asked Sharon to do some images of the FEMININE FACES OF GODDESS so that as WOMEN we could have something to RELATE to for our SUN SIGNS. And WOW! ........she took her skills, her talent, her love of BEAUTY and her sensitive contact to the collective images of the Feminine - and she RAN WITH IT.....Oh, SHA SHE (this was the name I called her growing up because I was the little sister) THANK YOU! THANK YOU! for all the beautiful images that are going into this web site and will now be available to women everywhere! The women in our class LOVED the feminine faces of their astrological make up and could so easily relate to them. Sharon's art really became the CENTERPIECE of our teachings! And still are!!!! "Reflections", Dissemenating Moon Phase -This is a phase of your 29 year Great Moon Cycle that you will want to learn about because it will help you to understand why you are feeling as you are right now and in what growth phase you are in and where you are traveling too. Your 29 Year Great Moon Cycle is an essential part of Feminine Astrology - when you come to comprehend the true value of this cycle to your Soul's Journey you will have a big "AHA"! 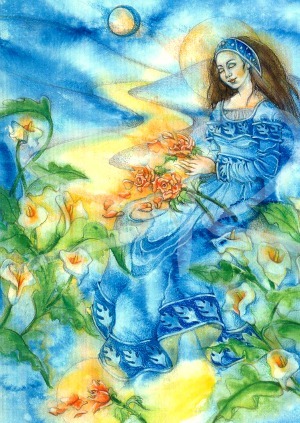 "Lightbearer" by Sharon is her Sagittarius image of women who were born under this Sun Sign. However, even if you were not born a SUN in Sagittarius, you have Sagittarius in your chart somewhere! I will help you find her. She is your Lightbearer! Click on ART FOR THE SOUL to see more of Sharon's art! 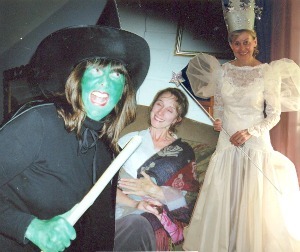 The WICKED WITCH of the WEST is ME (on the left). Sharon is GLENDA (on the right). (That lovely lady with the BLISSFILLED smile is our friend Margaret, Auntie Em, who balances out our two opposite natures.) 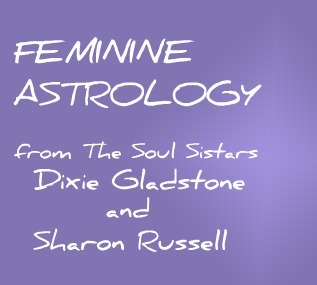 I am a SCORPIO, Sharon is a TAURUS, and we reenact the tension of the opposites in our two personalities — we call it POLAR OPPOSITES and it is something you will learn about as you find out more about FEMININE ASTROLOGY. The dark side is one side and the light side is another and what can balance that out is a MIDDLE WAY. Our friend, Margaret here, as AUTNTIE EM, has a way of balancing us both out. Margaret is one of our SISTARS and we now hope you will consider yourself one too! Sharon and I use one of our favorite childhood stories, Dorothy and the Wonderful Wizard of Oz, by Frank Baum to help you understand the journey of the feminine (Dorothy) throughout her lifetime in your 29 year GREAT MOON CYCLE which you can learn about by clicking on that part of our site. We think you are going to want to know just where you are on YOUR YELLOW BRICK ROAD right now, this year....and maybe for the rest of your life! Click here to go to our FEMININE ASTROLOGY page and learn more about this new way to look at your whole astrology wheel. Click on CYCLES OF BECOMING and this page will give you more details on YOUR 29 YEAR GREAT MOON CYCLE.